A hundred years ago, women in the workplace looked a little different than they do now. But many of the basic tenets of how to dress for an office job remain true today. 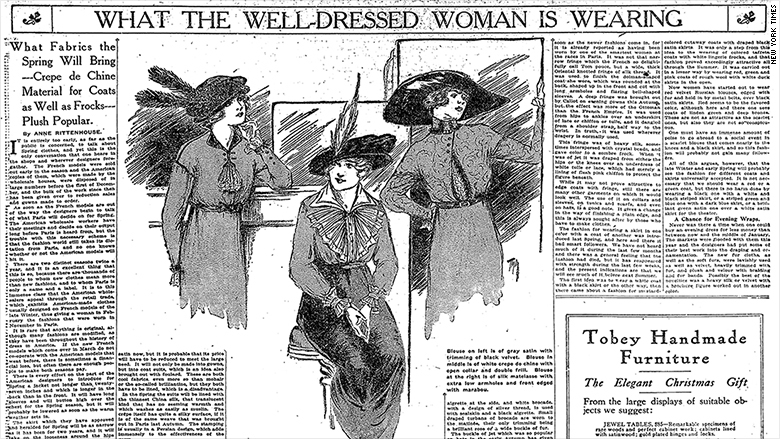 The authority of the time was legendary fashion columnist Anne Rittenhouse, whose column, "What the Well-Dressed Woman is Wearing" appeared in more than 100 newspapers throughout the early 20th century. In the August 1912 edition, "Rules for Dress for the Woman Wage Earner Are Simple and Easily Mastered -- Should Reflect Character," Rittenhouse outlined a list of rules that every "working girl" should follow. "The two phrases that once were spoken in pity -- 'working girl' and 'the old maid' -- no longer have a pathetic meaning," she wrote. Deirdre Clemente, professor at the University of Nevada, has dedicated her career to chronicling the evolution of women's dress. Clemente says many of Rittenhouse's points on professional clothes -- suiting, color, versatility and more -- stem from the influx of women workers entering the office in the early 20th century. "When corporations started to thrive in the 1890s, that's when colleges and schools and secretary schools start training women to be office workers," she says. "You start to see more advertisements for workwear and comfortable shoes." So how do Rittenhouse's rules stand up in today's (still confusing) world of women's workwear? "It is best for them to adopt a man's ideas about service and simplicity in dressing." Men have always had a simple work uniform -- button-down shirts, jackets and dress shoes. Rittenhouse recommends her readers copy the suiting uniform to build a wardrobe of interchangeable basics. Her suggestions are a bit outdated -- a stylish hat, neck fringe and "top coat" don't fit in 2017 -- but her guidance is still seen in women's professional work suits. Clemente says suiting gave women the one thing they've always craved in workwear: ease. "The rise of the women suit, and around that era you're talking about it becoming so popular, it has to do with the rise of versatile clothing," Clemente says. "We wanted to have something that was a touchstone outfit." "She will always feel freer and more at peace with herself than if she wears the blouse in which she has worked." If you're going out for dinner after work, Rittenhouse advised working ladies to either dress super formally, or (and this is "the better plan," she writes) to keep a secret stash of blouses and other accessories in her desk, for changing after work hours. Clemente says this points again to the greater mobility women's jobs brought to their lives -- writers like Rittenhouse acknowledged that women had social lives both outside the home and outside the office. "If [the wage-earner] were only wise she'd realize that black, enlivened by white, is the most reliable of colors when it comes to wearing a frock constantly." According to Clemente, color in work wardrobes has always been controversial, but at this point in time, it was particularly verboten. Rittenhouse may have advised her readers against it because of the practical dangers (if you spill coffee on a yellow suit, the horror! ), but more likely she was warning against the negative connotations (in the early 1900s, people still associated bright colors like red with "women of the night"). "There was this idea that color was too showy for proper, modest girls," Clemente says. "The wage-earner who chooses flashy clothes is barring herself out of a good position." Oh, those working women and their budgets. "They are too prone to buy a thing that will not last and wear a thing that cannot last," Rittenhouse bemoans in her column. Take a look around your office at the scores of threadbare H&M blouses and worn fast-fashion heels -- not much has changed, Anne.